While summer might be “wedding season,” fall nuptials are not to be forgotten! Finding the right summer wedding look might seem easy, throw on a cute dress and go, but how hard is it to plan a stylish wedding guest look when the temps cool down? 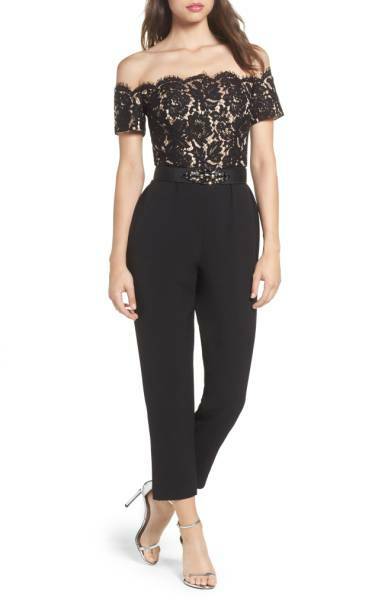 I found this jumpsuit from H&M that would be the perfect fall go-to wedding guest attire! This jumpsuit can easily transition from a casual fall outdoor wedding to a formal evening ceremony at an estate. If the weather is still warm, keep the look as is, if the temps drop—add a faux fur jacket to accent the style. This jumpsuit embraces the off the shoulder trend, while the skinny strap helps it stay up as you dance the night away celebrating the bride and groom! The style is chic, clean and stylish, yet comfortable for an all day affair like a fall wedding.